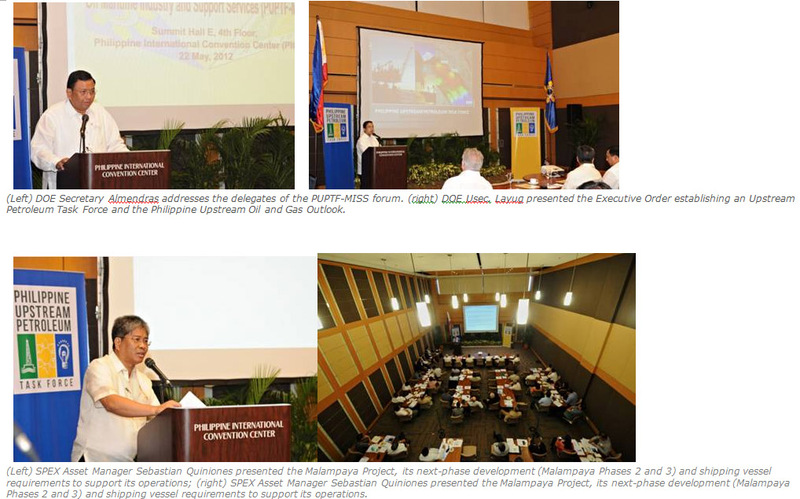 Shell Philippines Exploration B.V. (SPEX), operator of the Malampaya Deepwater Gas-to-Power Project, supported the Department of Energy (DOE) in staging the “Philippine Upstream Petroleum Task Force Forum on Maritime Industry and Support Services (PUPTF-MISS)”. The forum brought together both government and the private sector to discuss relevant Upstream concerns and challenges on maritime support services to help further the growth of the Philippine Upstream industry. Attended by representatives from the DOE, Department of Transportation and Communication (DOTC), Maritime Industry Authority (MARINA), Philippine Coast Guard, Philippine Ports Authority (PPA), various Upstream petroleum service contractors, the Philippine Inter-Island Shipping Association of the Philippines, Inc. (PISA) and other companies in the marine support services, the forum was also an opportunity for speakers to present updates on their respective projects and activities. Sec. Almendras speech was followed by the presentation of DOE Undersecretary Jose M. Layug Jr., who discussed the salient features of Executive Order 60, which established the Philippine Upstream Petroleum Task Force. Usec. 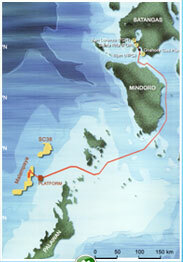 Layug, likewise, gave an insight into the Philippine Upstream Oil and Gas Outlook. Shell Philippines Exploration B.V. (SPEX) Local Senior Upstream Representative, Asset Manager and Managing Director Sebastian Quiniones also spoke in the forum’s morning session. Quiniones presented on the Malampaya Project, its next-phase development (Malampaya Phases 2 and 3) and shipping vessel requirements to support its operations. Other speakers and presenters at the forum were MARINA Administrator Atty. Nicasio A. Conti, PAP President Atty. Edgardo Hernandez, Galoc Production Company Operations Manager Jeffrey Hustler, PISA Executive Director Ernesto S. Paguyo, DOE-Energy Resource Development Bureau Acting Director Ismael U. Ocampo, BHP Billiton Petroleum (Phils) Corporation Country Manager Romeo Solis, Philippine National Oil Company-Exploration Corporation Exploration Manager Jimmy A. Bacud, and Forum Energy Phils. Inc. President Jose Raymund L. Apostol.